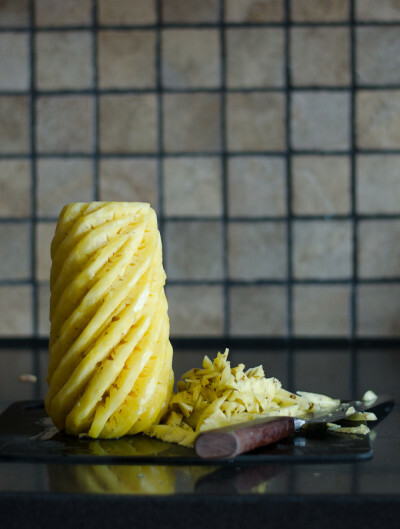 When I was cutting up pineapple for my new favourite dessert the other day, our dinner guest commented on how artistic I was being about it. I had never thought about it before that point – in my mind there was only one way I knew how to cut a pineapple. There are other ways, obviously, but this was a way born of habit and from watching market vendors and friend’s mothers do it for years. One Facebook post and a quick Google later, I discovered that although not everyone cuts their pineapple this way, it’s not specifically an Asian thing either. I may have gotten a little carried away on a Google quest, but did you know that in 18th century England, pineapples were a status symbol? If you had pineapple at a party back then, you were doing very, very well. 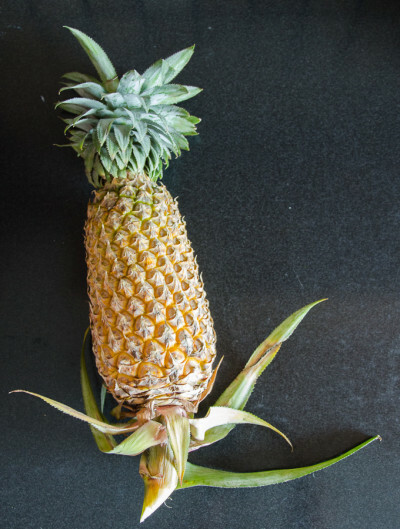 Showcasing them at the dinner table became a fashion required of 18th century nobility, but because pineapples didn’t grow very well in England, they were hideously expensive. So sought after were the prickly fruits that they were sometimes rented them to households by the day. Later, the same fruit was sold to other, more affluent clients who actually ate it. If people couldn’t afford to buy or rent the real fruit, they bought porcelain dishes and teapots in the shape of a pineapple, which became hugely popular starting in the 1760s. Flash forward to now, where modern transportation and greenhouses have made pineapples affordable for most. The ones here in Sri Lanka are amazing – fresh, sweet, low in acidity. I dare say they’re a lot better than Australian pineapples. Here’s how to cut them, as Kenji from Serious Eats would say, like a badass. 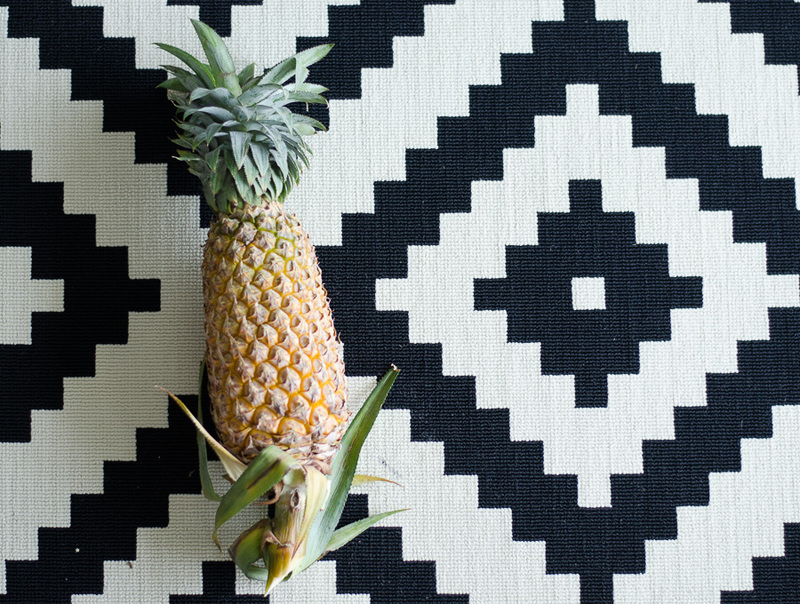 Pineapples won’t sweeten or improve in flavour once picked, so choosing well is the essential first step. My first rule of choosing a good pineapple is if you can’t smell it, it’s not ripe and so won’t have that intense pineapple flavour or sweetness. Sniff the base, it should smell sweet and, well… pineapple-y for lack of a better word. If it has an alcoholic or fermentation-like smell, it’s starting to rot, so don’t buy it unless your aim is to make some kind of weird moonshine. In my experience, colour is not as good an indicator but if you’re going on appearance, look for golden yellow coloured skin that’s free from soft spots or bruises, fresh green leaves that aren’t shrivelled up and fruit that feels heavy. 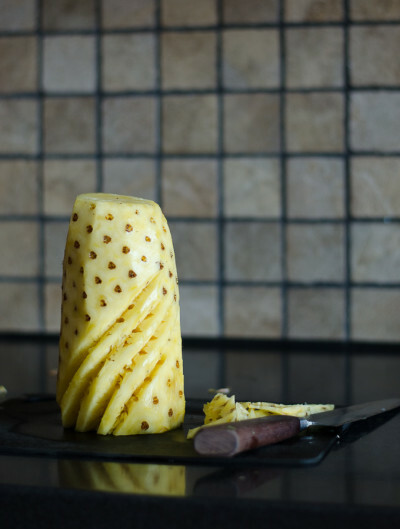 If you’re further away from the tropics, they’re going to be greener – fully ripe pineapples don’t ship well, so pineapples are often harvested early and are less likely to be that beautiful golden yellow colour. Remember that they’re not going to ripen further so don’t buy a green pineapple and take it home expecting it to become sweeter. 2. Cut off the top and bottom. The top and bottom of the core are quite woody, so you can err towards the more generous side here – cut off the top and bottom and stand the fruit up on the chopping board. 3. Trim off the prickly skin. 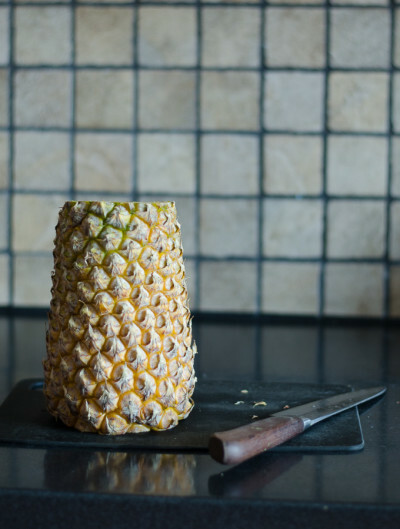 Leaving the pineapple on the board, and working from top to bottom, use your knife to trim the outer skin. You don’t have to get all the prickly brown ‘eyes’ off – we’ll get to that later, but you do need to remove the outer skin. If you see the yellow honeycomb pattern (that’s shown on the right half of the pineapple in this picture) keep shaving off a little more until it’s all gone. 4. Find the pattern and start cutting out the eyes. You’re looking for a diagonal spiral pattern that traces through the brown bits. Pick up the fruit in one hand, and using your other make V-shaped cuts that go under the eyes. It can a little slippery if it’s a very ripe fruit, so start with trying to cut out only a few brown bits at a time and work diagonally around the fruit. Ready to eat. Or place on a pedestal in your most formal dining room. Alternatively, you can then cut into wedges, spears, rings or whatever shape you prefer. Remember to trim the core if you are particularly sensitive to pineapple making your mouth itch. 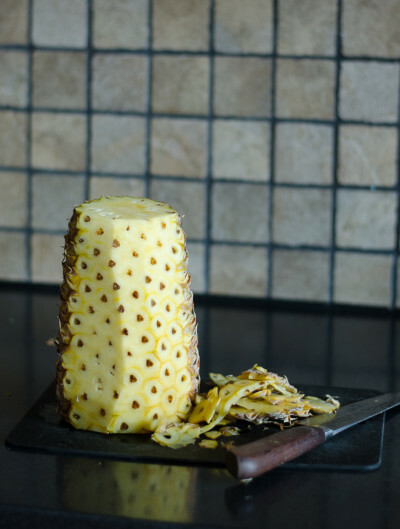 Remember that pineapple contains a protein dissolving enzyme, bromelain, which will stop jellies from setting so if you’re going to use it in a jelly, it needs to be cooked first.